There is a subtle, but crucial difference in knowing that conditions are right for something to happen, and believing that they will. The first requires that one be one be confident in what has happened before, but the latter is a confidence in the unknown, in the yet-to-come. The first is all about preparation; the second is all about taking that leap of faith, and believing, without empirical evidence, that the outcome will be a certain way. When a friend asked me if I was ready to run 100km (62 miles) through the mountains, I told him that I was unable to visualize beyond 60km-- that is, I was unable to access information about how I would feel, what my legs and hips and feet would feel like, how my stomach would feel, and whether my mind would be in the gutter, in the clouds, or insane. In all of my training and race runs, I had never gone beyond 60km. All of the training runs leading up to this had never breached the 50km mark, and the last time I had run that (about a month before the race) I had felt the idea of 50km being the half way point was absolutely ludicrous! The crew getting ready for adventure! The 60km boys waiting to crush it, and crush it they did. The Yang Yang Song-I Ultramarathon is not unfamiliar territory-- I ran the 60km race last year and three friends ran the 100km. I knew a good deal about the course and I was preparing, mentally at least, to return and do the hundred for a year. The only difference this year was the 1 AM start, two hours earlier than the previous year's 100km starters and four hours earlier than my 60km start. That meant that I would be running through a good five and half hours of darkness. I never worried too much about this. Our Jirisan run in late summer had a good three and half hours in the dark, and what I learned from that was in some ways, the darkness is your friend. For example, you don't see the climbs, so you don't register them mentally. You simply do them with no energy wasted in thinking about them. Another strange benefit is the psychedelic nature of your entire visual reality being mostly confined to a circle of light a few feet in front of you. It becomes a sort of cocoon of protection, and beyond paying attention to the rocky steps of the access road, the mind was left free to pursue its thoughts. Its sort of like the idea behind the isolation tanks, in that my brain moves into this transcendent sort of theta phase, a feeling of almost relaxation. Running with the headlamp for 40km through the woods might not seem relaxing, but in a way it was. "Hey, you like your Hokas?" "Yeah, I like em for the longer stuff." and so on... very sophisticated conversations. At least compared to the grunts and the nods and the howls and the heavy breathing that became a form of communication in the latter half of the race. But the first forty kilometers were really easy. I found a good, conservative rhythm. I ran in a group for a while, then I would hang back or push forward. Then I would run in another group for a while. It felt good to mix it up. red shoe laces. I'm on the right side of the frame starting my watch. The day before, I had driven to Yang Yang to arrive at around 5, to meet Brandon and Travis for dinner. We had a great dinner, got to know a bit about each other, talked race stuff and geeked out on strange knowledge about the ultra racing world and its heroes. And then we tried to settle in at our little make shift camp at the children's playground near the start of the race. I crawled into my tent at 7:30 with my headlamp and a book, but sleep, not surprisingly, never came. Folks started arriving, Stephen and Katie pulled in, as well as Zac from Gangneung. The tension and excitement became tangible, and the best I could do was lie there in thought, read a few pages here and there, and listen to music. So, once I toed the starting line, I knew that I'd be missing an entire night of sleep. Surprisingly, though, I felt great throughout the night. I was just behind Katie and a Korean man who we later realized may have been Michael Kim's "Trail Angel" the year before. I followed their headlamp glows, like two lightening bugs, for the long, steady descent down to the 40km aid station, which was where we had started our races the year before. How I felt coming into that station and how I felt when I left was like a bizarro world where reality becomes its opposite. I felt great going in, awful going out. The sun was just beginning to color the western sky with its glow, and yet my body was beginning to shut down from lack of sleep. I became frigidly cold from sitting for a few minutes, and the rest at the aid station seemed to beat me up more than the 40km. I walked out of the aid station with Katie feeling cold, tired, and pretty dreadful. And in these spirits, we began the long climb out of the valley. This year, as the light began to come out, I was able to see the amazing beauty of the valley as we ascended. Beautiful evergreens, a cascading stream, all underneath a purple, twilit sky that still contained smatterings of firmament that had blazed with stars through the night. It was truly inspiring, in spite of my condition. And Katie said something that was utterly crucial in pulling me back from the edge of oblivion. She said, "We left our egos at the starting line." And that clicked. That made sense. It reminded me of everything that I had prayed for in terms of staying positive and strong in this race. The idea of running wasn't about beating my time goal, or being competitive, or even about getting validation for finishing. I didn't need to run this 100km to prove myself. I was already validated. Recently, I was studying this Tim Keller commentary on 1 Corinthians 3:2-4:7 entitled The Freedom of Self Forgetfulness. It discussed the way the way that the ego works, the way we judge others and ourselves, and how the gospel frees us from that judgment of the ego. All that we do doesn't have to emit from a deep need to stroke the ego, that temporary and fickle thing; but rather our actions emit from a place of deep joy and contentment in knowing that all of our worth has already been proven on the cross. In this way, we can forget ourselves in terms of how everything we do is somehow building us up as human beings or adding meaning to our lives. Rather, our actions can be a reflection of love, not as a point to prove to ourselves or others, or a footrace with our own sense of self worth. In any case, the verdict is already in. Christ has vouched for me, He has paid my ransom, and and liberated me from the slavery of self esteem. And Katie reminded me of that-- the ego, in its proper place, was not a force driving me through this 100km. I was essentially freed to run, to move forward, to walk if need be. And that was the crucible of the race: that freedom that I found through that rough patch. Just keep moving. Zac smiling his way through 100km. 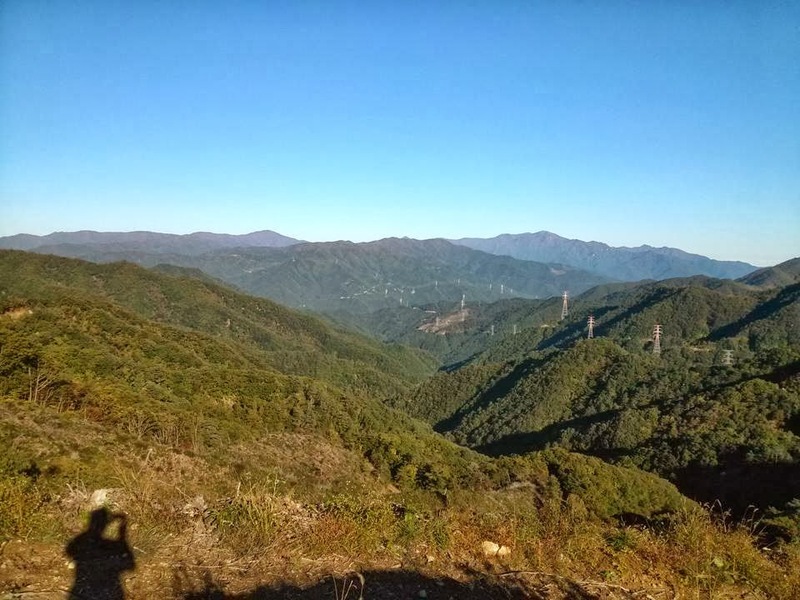 So, we struggled up the beautiful valley, along a melodious brook, underneath these behemoth power line towers that Katie later confessed she never saw. And another beautiful thing happened. My memory served me incorrectly (and fortuitously) that the climb was 12km. At one point, with about a kilometer left to reach the summit, I exclaimed that this was the longest 12km climb on the planet, Katie corrected me that it was 16km. I was elated by the news, and my mind happily collected the four bonus kilometers at the top. Once there, I sat down, drank some Coke, ate a banana, and refilled my camelbak. After maybe three minutes of sitting, I stood and felt that old familiar stiffness in my hips and legs. As I gingerly made my way down the mountain, the Trail Angel passed me, "Bulpyeon-haejo?" which means, in this context, "Pretty sore, huh?" I grimaced in the affirmative, and he shot me a thumbs up and a "Fighting", and it was at this point I remembered the magic pills in my pack, the little Vitamin I's, the ibuprofen. I hadn't planned on taking these guys until late in the race and only if they were absolutely necessary. Well, I reasoned, it is later in the race (56km) and it is gonna be a long painful descent, so what the heck? I popped one, put in my headphones and listened to an old episode of Talk Ultra. There is something very meta and very encouraging about listening to a podcast about ultrarunning in the very act of running an ultra. Before I knew it, I was moving pretty swiftly down the mountain, listening to JB Benna (producer of Ubreakable, the 2010 Western States movie), and I had forgotten my pain. I caught up with Katie at the bottom, just short of the aid station that I knew from before has this amazing fish stew and rice, and she told me that her foot was killing her. I got some magic pills, I said, and suddenly became the drug dealer on the mountain. Katie had tweaked her ankle 30km in, thought it was minor, but the more than 30km after had only increased the pain. I gave her an ibuprofen as a slurped down some stew and inhaled some sticky rice. We learned from the station volunteers that the leader was poised to run a sub 10. That's ridiculous, I thought. As we exited the aid station, I saw that Katie was limping. Dammit, this didn't look good. We were still 36km away from finishing and her limp looked like it would make her drop. I jogged on ahead to give her some space to work things out, and then, three or four kilometers later, Katie comes flying by me, "Thanks for the ibuprofen! ", and then just kept hammering up the hill. That was the Tibbetts that I was more accustomed to, the one that rapidly advances up mountains and recedes from my line of sight. I had asked her before when she would "make her move", knowing the potential in those legs, and I figured this was it. I probably wouldn't see her again. I was feeling pretty wrecked, so I just kept shuffling, walking, shuffling, and walking. I though at this point, this is gonna take fourteen or more hours at this rate. My race strategy going in to the race was inspired by Speedgoat Karl Meltzer and Anton Krupicka, who say that the only important part of a race is the final 20%, and that if you are gonna turn it on and have the legs to do it, that is the time. 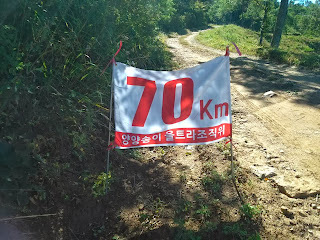 Knowing what I knew about the Yang Yang course, I adjusted my plan to start "turning it on" at kilometer 70. I thought this because I knew that all of the big climbs were finished, and that the remainder of the course was mostly rollers and then a long and steady descent down the mountain. The 70km mark was right at the top of the climb up from the fish stew aid station, and so I popped another vitamin I, and changed from the podcast to music, and started to slowly build up my tempo. My legs seemed to kick into a higher gear, something that never happens. When I did the 60 the year before, my splits throughout the race got progressively slower. Even in training runs I find myself slowing down in the latter miles. But my conservative pace early on, and the slow kilometers between 40 and 70km markers, put me into altogether new territory. I had never run this far, so why should I be surprised at anything? In this distance barriers were constantly be stripped away, and I found myself moving along at a pretty quick and steady clip. The next ten kilometers blazed by, and I found myself entering that advantageous space where my mind grasped that I was now just under 20km from finishing. I kept pushing, and in so doing, starting passing folks (I hadn't passed anyone since probably around 20 kilometers in the wee hours of the morning). These were all the folks who I had run with in the early stages of the race and had surged forward when I slowed down. This, following Meltzer's plan, was exactly what I had tried to visualize. Meltzer calls it "picking up the carnage" in the later stages. I was just happy to start seeing people again. 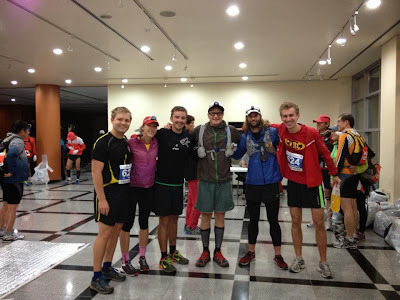 I caught up with the Trail Angel, and Jang Boo, and others whom I'd seen early in the race. This got me even more pumped, and I flew into the aid station at 85 kilometers, just as Katie was pulling out. I couldn't believe I saw her! This aid station at 85km had something very special the year before-- canned peaches. I never eat canned peaches, but there is just something about them, and the syrup that they come in, that quenches you deep down in your soul in an ultra. The sugary syrup seems to pass right through the stomach lining directly into the blood stream, filling your entire body with an epic, peach syrup sugar high. I asked the aid station workers for extra syrup and slurped it down. I quickly refilled my water bottle and tried to blaze out of the station, but there was a low grade climb, and soon I was hobbling up the hill. The doubts set in-- maybe I shouldn't have pushed it at 70km, maybe I should have waited until 80. Again, the fatigue from earlier was on me. Relentless forward progress. One step in front of the other. That's all you have to do, I was reminded, and again, I felt that sweet submission that I had earlier in the race. Time was of no consequence. Pain was peripheral, almost pleasant. 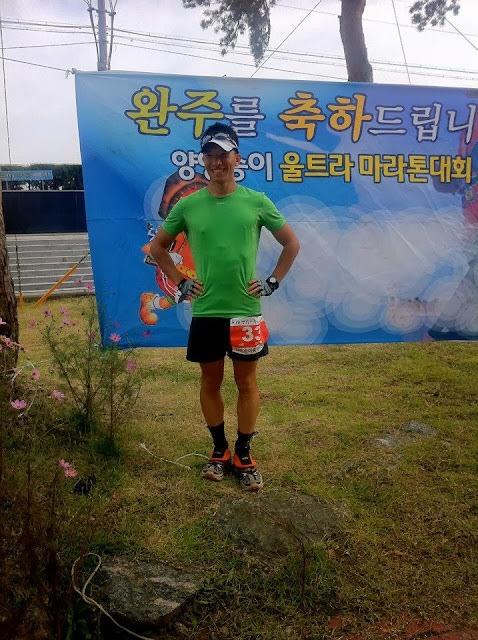 Another runner I knew from our facebook group was Jang Boo, a younger guy serving in the Korean military and has an obvious, awesome passion for trail running, started leap-frogging with me at this point. We were both, I think, beyond the point of conversing, but we were communicating in a fashion, both slowly pushing and encouraging one another. I was getting lost in my music and trying to find a steady rhythm that would bring me home, but the terrain was really rolling, and we would walk each little ascent. In my headphones I had a play list that ranged from bluegrass to death metal. A song by the band Slayer popped up on the random mix, and this signaled a new turn, a new chapter in the race. I dug out my I Phone and set it to play the entire album of South of Heaven, and I dug in-- no longer waxing philosophically about the run, or submitting to the ethos of my community of peers. This was game on. I popped yet another ibuprofen (not wise), sucked down a gel, and turned up the death metal. I glanced down at my watch, for the first time in ages, and realized that I might still make that sub 13 hour time that I had pushed out of mind. I started running the downhill, and running it fast. I was using the inside corners of all turns in the road, trying to minimize added distance, and my feet were merely trouncing along to the death march drums of the South of Heaven track list. I found a pocket, a higher gear, if you will, of energy that I had only tapped into in shorter races. It was this special calculus that says the more you give, the more you will receive. I pushed harder, and in doing so I felt more energized. When I hit the steep hills that would normally be hell on my tender bones and joints, I extended my stride and moved even faster. Before I knew it, the highway came into sight, and I was on the road, the road home. The previous year, this stretch of road killed me. For one, it starts at the 95km mark, so you think you have 5km to run, but it is really more like 7. It was at this point last year that Sonya had passed me, flying up the road, and I was destroyed and unable to keep up. This year, I tried to harness Sonya's energy, and I just kept moving. I saw another runner about 500 meters up the long flat road through the farms, and I caught him after two kilometers. I ran over three bridges that are slightly arched, the minimal elevation making me walk the year before. I finally saw the balloons that hovered high above the festival grounds where our finish was, where people were, where stopping was. I pushed harder. I dug into a section of road where there was no shoulder due to construction, and I was running into traffic. The frustration at this poor planning from last year no longer present. Everything was about finishing. I made it to the bridge, passed a few more guys, and kept pushing. I hit the festival strip, passed by vendors and performers, families who gave this sweaty, destroyed looking waygookin almost no notice, and I just kept pushing, until I saw that Glorious yellow arch, that Promised Land where my work and toil would be finished forevermore. I saw Sessions, and he cheered and chased me with the GoPro, I heard whoops and hollers from Brandon and Travis, and pushed still, the final few meters over the brick surface, and I crossed the tape, a changed man. The time was 13:04. Didn't make my sub 13 but that didn't matter one iota. My odyssey had brought me back home. Katie is all smiles after running on a tweaked ankle for 70km! Jang Boo ran a super solid race! Zac finishing his second 100km race! Travis the speedster comes in with a new course record for the 60km-- 6:20. That's flying! Sessions ran a super strong race, coming in at 7:20. Air Brandon comes flying into his first ultra finish! Rookie mistake, Ibuprofen. I was only vaguely aware of the dangers of ibuprofen and dehydration and its effects on the kidneys. I should have done my research. I think I got lucky this time, but if you are planning on running an ultra please be aware of the possible dangers of kidney damage with ibuprofen. I think if it is taken very minimally and if you are super on top of your hydration, it can be ok. But I think the best approach is to try to make it without it. I took three (maybe four) over a six hour period, and drank plenty of water, but I think the ibuprofen had a lot to do with my nausea and inability to digest food towards the end of the race. In some ways it saved me, but I think next time I'll soldier through the pain much longer. The Trail Angel. The trail angel is someone whom we think helped out Michael Kim with his legendary struggle through the Yang Yang 100km in 2012. According to Mike, he talked him out of quitting, he reminded him of his family and why he was running. Katie and I now are under the suspicion that the Trail Angel is indeed an ethereal being from another world. Katie even thinks he may have succumbed to the doldrums between the 40 and 70km mark, and now makes a pilgrimage from heaven each year to encourage and strengthen fading runners. Whatever his story, we are all very grateful, Trail Angel, wherever you are! Post Race: As soon as I finished, Travis handed me an ice cold beer, which I chugged dutifully. I felt fine, went and got a shower, and then returned to watch some runners come in. I laid down in the grass and the sky started to spin. I felt awful, and just before we left, I stuck my fingers down my throat and purged the most unbelievably foul concoction of espresso gels, peach syrup, and beer. Nothing in the last few hours had made it too far through my system. I felt much better after the self induced upchucking, but it ruined my plans of having a few beers over the course of the afternoon, looking out at the beach, and smoking my pipe. I was left feeling slightly nauseous for a couple of days. My legs, painwise, recovered super quick. I was able to get out on a run Wednesday and Friday, and have decided to run the Chuncheon Marathon on October 26th. Don't think I'll be doing any PRing on my legs, but I am excited to run it. The last time I ran it was 2008! I love my Jina, my Jonah, the HKA crew and Mike Kim and Robb Kerr-- thanks guys for always inspiring. I am so blessed by God to have my health and the yearning in my veins to explore His beautiful creation, and to play in and with His provision. "He brought me up up out of the pit of destruction, out of the miry clay, And He set my feet upon a rock making my footsteps firm." This is a brilliant race report. Loved your take on the race. You did an awesome job! Hope to see you out on the trails again! Great write up Justin! Watching your running this year has been nothing short of incredibly inspiring and I can't wait to see more of it. And hopefully get a few more in with you!